New York taxi drivers, emboldened by five suicides in their ranks and desperate financial straits, are pressing for laws to protect them against ride-hailing companies. Why it matters: Like cabbies around the world, New York drivers have suffered a plunge in income since the rise of Uber — and other ride hailing services — and city leaders say they are considering laws to help them, including a cap on ride-hailing vehicles in the city. 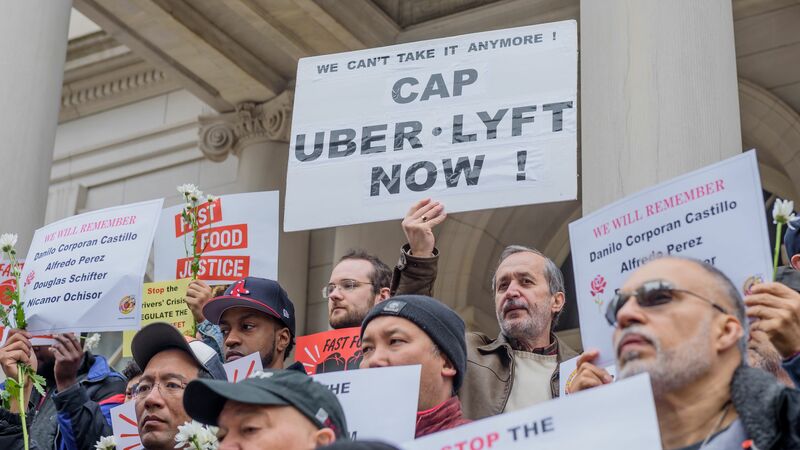 Speaking before a rally yesterday, Bhairavi Desai, head of the New York Taxi Workers Alliance, also urged a minimum metered fare across the car transport business, including taxis and Uber. The rally came two days after authorities pulled the body of taxi driver Kenny Chow from the Harlem River. Chow was having trouble paying off a $700,000 loan for his taxi medallion, the license to operate a yellow cab. In a statement to Axios, the New York Taxi Workers Alliance called it a suicide, the fifth in five months. It blamed "financial ruin" caused by the chaotic driving industry, its numbers only loosely controlled by the city. Worth over $1 million as recently as 2014, the medallions now sell for as little as $175,000, according to the NYT. By the numbers: The WSJ's Paul Berger reports, "About 70,000 app-based vehicles compete with more than 30,000 black cars and livery cars, 13,500 yellow taxis and about 4,000 green taxis, according to the New York City Taxi and Limousine Commission." Desai has said ride-hailing drivers have suffered a drop in pay, too. But the suicides risk more reputational damage to Uber, which is working to repair its image after years of muscling into cities regardless of local taxi rules, and relying on aggressive lawyers, to stay there. In a statement to Axios, Uber said, "We are deeply saddened and our thoughts are with Mr. Chow's family. Drivers who own individual medallions have been left behind by change and exploited by lenders, and we support action that eases their financial burden." Regarding the push for a cap on ride-hailing vehicles, Uber added, "New vehicles keep up with the growing demand for rides outside of Manhattan. Capping the number of Ubers would only hurt the millions of outer borough riders who have long been ignored by yellow taxis and who don't have access to reliable public transit."